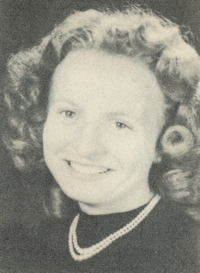 Obituary – Kienholz, Betty Mae (Stout) « Perry High School Alumni Association, Inc.
Y-Teens ’46-’48, Perryscope Staff ’48-’49. 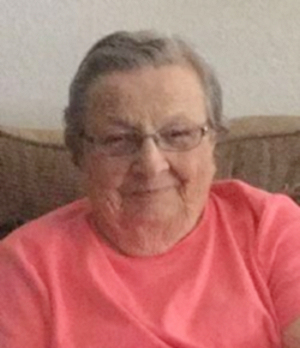 Betty Mae Kienholz, 86, of Orlando, Oklahoma passed away on the morning of August 16, 2017, in Perry Memorial Hospital. She was born in Covington, Oklahoma on January 30, 1931 to Harold and Lena (Boepple) Stout Carlile. She attended school in Perry and graduated from Perry High School. She was married to Eldon D. Kienholz on August 14, 1951, in Lucien, Oklahoma and they made their home in Orlando, Oklahoma. Betty’s family knew her to be a wonderful cook. Her macaroni and cheese, pies and cakes were always requested and looked forward to. Betty used scrap material from her sewing to piece quilts for her children. Her two favorite card games were Pitch and Kings Corner. She was a member of the United Methodist Church of Lucien where she taught Sunday School and helped in many Vacation Bible Schools across the years. Betty is survived by three sons, Glen Kienholz and his wife, Kim, of Orlando, Oklahoma, Don Kienholz of Perkins, Oklahoma and Ron Kienholz and his wife, Jodi, of Glencoe, Oklahoma; two daughters, Gayla Manning and her husband, Richard, of Choctaw, Oklahoma and Wanda Morrison and her husband, Grover, of Houston, Texas; two sisters, Donna Sample of Chickasha, Oklahoma and Twila Bales of California; two brothers, Larry Carlile of Perry, Oklahoma and Mark Carlile of Colorado; a brother in law and sister in law, James and Johnna Kienholz of Oklahoma City, Oklahoma. Thirteen grandchildren; eleven great-grandchildren and many nieces, nephews, and cousins also survive. She was preceded in death by her husband, Eldon and one infant son; her parents, sister, Nina Hoy, and brother, Harold Stout. Services for Ms. Betty Mae Kienholz have been entrusted to Brown-Dugger Funeral Home and will be held on Saturday, August 19, 2017, at 10:00 am in the Lucien United Methodist Church with Reverend Kim Giles officiating. Burial will follow at the McGuire Cemetery. For those desiring, memorial donations may be made to the Lucien United Methodist Church or the American Diabetes Association, in the care of Brown-Dugger Funeral Home, 1010 N. 7th Street, Perry, Oklahoma 73077.